This three in one product is certified by a German testing authority as being Food Safe. It is the top of the line: a highly advanced fluoride based compound that works on a microscopic level to prevent germs and food from entering your polished and finished stone surfaces and countertops. This conditioner can be used on our Food Slabs and Bowlders. It also cleans and revitalizes natural stone and keeps it looking new and impenetrable to stains, even red wine. 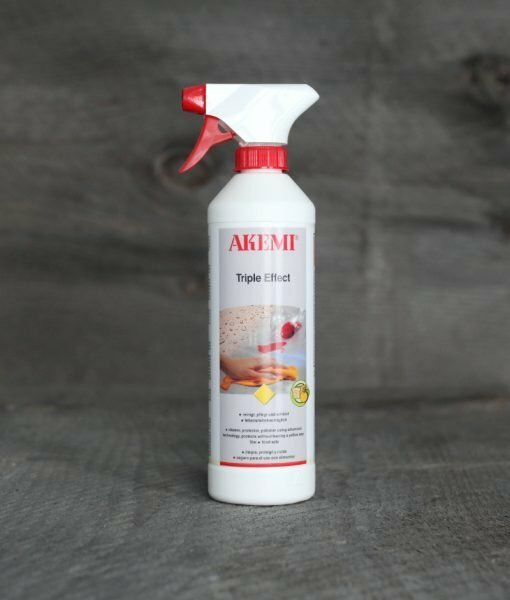 AKEMI Triple Effect is Food Safe as rated by a German Testing Authority. It is suited for the regular cleaning, care and protection of absorbent, fine ground or polished natural and cast stones in use on tables, kitchen tops or other small areas. It removes slight staining and the fluoride based compounds protect stone from staining. The product is odorless and supplied in a pump spray bottle. This conditioner can be used on our Food Slabs and Bowlders.